Welcome back, stained glass lovers! In our last blog post, we discussed some of the reasons why stained glass is making a comeback in modern homes and businesses, including its beauty, uniqueness, and versatility. As it turns out, there are many other reasons people are turning to stained glass as a way to upgrade the entryway of their properties, which we will continue outlining here. Although many people choose stained glass windows and doors for their beauty, sometimes it isn’t just about the breathtaking aesthetic. Countless studies have shown that natural light is good for you, as it increases your energy levels, improves your mood, makes you more productive, the list goes on. People tend to subconsciously seek out the softness and warmth of natural light, which ultimately has an influence on their home remodeling decisions. Unlike other sources of natural light like bathroom skylights, however, stained glass lets in plenty of natural light while also enhancing its beauty as it filters through different colors, designs, and textures. Many people love the way stained glass windows and doors disperse natural light throughout the room and enjoy spending time in the beautiful environment it creates. Stained glass is typically far more intricate, decorative, and colorful than the plain glass found in other windows and doors, meaning that homes and businesses that incorporate stained glass into their entryways are able to enjoy a more private space. Anyone who has tried to peek through stained glass before will tell you that anything on the other side is distorted, rendering it nearly impossible to make out the people and furniture inside. Sometimes all it takes to make your home or business more secure are stained glass windows and doors, and of course, trusty locks. When it comes to enhancing both the beauty and security of your home or business, there is no better feature to use than stained glass windows and doors. Given that stained glass has the power to transform any home or business into a stunning palace full of natural light, heads are bound to turn as passersby stop to admire it as a work of art. As with many other methods of home improvement, upgrading your entryway with stained glass windows and doors is a great way to turn something mundane into a mesmerizing feature that enhances the overall beauty of your property. Stained glass windows and doors add a kind of eye-catching beauty that is simply hard not to look at and appreciate. In fact, many homes that boast beautiful stained glass windows and doors tend to sell faster and for a higher price than those with a lifeless entryway. 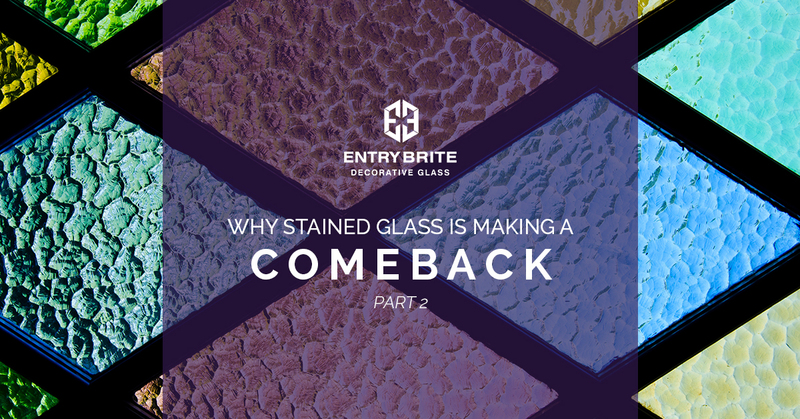 At Entry Brite, one of the things we love most about home remodeling is the way that timeless classics like stained glass resurface with modern twists that make them even more beautiful than they were before. In our years of home design experience, no other remodeling feature has the power to transform any home or business from conventional to uniquely beautiful in quite the same way that stained glass does. If you love the unique beauty of stained glass as much as we do, stop by our shops in Phoenix and Las Vegas, or give us a call today! We’d love to walk you through all of our classic, old world, contemporary, eclectic, and craftsman styles so you can pick out the perfect stained glass windows and doors for your home or business.